Toda por la Raza Chicano Chicano Busca Tu libeeracian El libro Es tu dios Rindele homenaye Que sera tu companero Quien Illumine tu sendero Sacrifica sacrifica Todo el tiempo Que tengas a la mano Recordando recordando Que en tu nido Esta un pequenito Chicano -Lucas Castillo- EL ESPEJO DEL PUEBLO El TEATRO DE ZAPATA has been an effective tool in building an awareness of the Chicano movement to the people, La Raza, in the Midwest. it has played an inportant part as a mirror for the people of Aztlan, los Chicanos. The Actos performed by el Teatro reflect the tragedy, frustrations, image, happiness, and needs of La Raza. 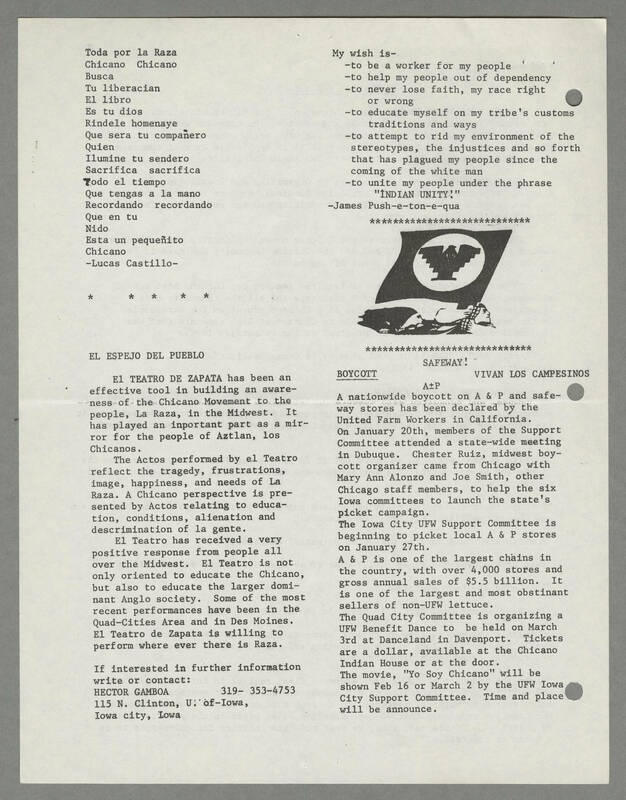 A Chicano perspective is presented by Actos relating to education, conditions, alienation and descrimination of la gente. El Teatro has received a very positive response from people all over the Midwest. El Teatro is not only oriented to educate the Chicano, but also to educate the larger dominant Anglo society. some of the most recent performances have been in the Quad-Cities Area and in Des Moines. El Teatro de Zapata is willing to perform where ever there is Raza If interested in further information write or contact: HECTOR GAMBOA 319- 353-4753 115 N. Clinton, U of-Iowa, Iowa city, Iowa My wish is- -to be a worker for my people -to help my people out of dependency - to never lose faith, my race right or wrong -to educate myself on my tribe's customs traditions and ways -to attempt to rid my environment of the stereotypes, the injustices and so forth that has plagued my people since the coming of the white man -to unite my people under the phrase "INDIAN UNITY!" -James Push-e-ton-e-qua SAFEWAY! [[underline]]BOYCOTT[[end underline]] VIVAN LOS CAMPESINOS A+_P A nationwide boycott on A & P and safeway stores has been declared by the United Farm Workers in California. On January 20th, members of the Support Committee attended a state-wide meeting in Dubuque. Chester Ruiz, midwest boycott organizer came from Chicago with Mary Ann Alonzo and Joe Smith, other Chicago staff members, to help the six Iowa committees to launch the state's picket campaign. The Iowa City UFW Support Committee is beginning to picket local A & P stores on January 27th. A & P is one of the largest chains int he country, with over 4,000 stores and gross annual sales of $5.5 billion. It is one of the largest and most obstinant sellers of non-UFW lettuce. The Quad City Committee is organizing a UFW Benefit Dance to be held on March 3rd at Danceland in Davenport. Tickets are a dollar, available at the Chicano Indian House or at the door. The movie, "Yo Soy Chicano" will be shown Feb 16 or Marc 2 by the UFW Iowa City Support Committee. Time and place will be announce.